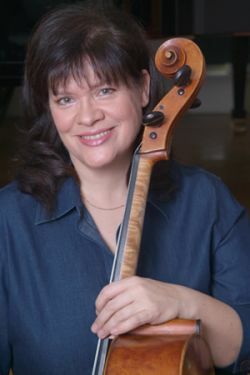 A member of the Orion Ensemble since 1995, cellist JUDY STONE performs regularly with Music of the Baroque where she has also been a featured soloist. She also performs with the Chicago Symphony Orchestra, Lyric Opera of Chicago, Chicago Philharmonic and Chicago Opera Theater. Ms. Stone has appeared as soloist with orchestras throughout the United States, including the Chicago Symphony Orchestra. She has been recognized in national and international competitions, such as the prestigious Tchaikovsky Competition in Moscow, where she was awarded a Performers Certificate. A Chicago native, Ms. Stone received her music education at the Interlochen Arts Academy in Michigan, and graduated with honors from Chicago Musical College of Roosevelt University, where she earned bachelor and master of music degrees under the tutelage of cellist Karl Fruh. Ms. Stone is a very sought after chamber musician, can also be heard on many television and radio commercials, and maintains a private teaching studio. In the summer of 2007 she took time out from her busy schedule to perform works by Johannes Brahms, Marko Tajcevic, and Chicagoan Robert Kritz with Vermillion (clarinetist Bonnie Campbell and Diana Schmück) at the International Clarinet Association’s ClarinetFest in Vancouver, British Columbia.